In The Adventures of Anuk by Suzanne Mondoux, Anuk has spent a happy childhood in the Inn with her guardians, Julea and Lucca. On her sixteenth birthday, she discovers that she has to return to her place of birth, Roese Island. Anuk is not pleased, but she is told it is her destiny that, as an Assisi Human, she must return to maintain harmony between the animal kingdom and human beings. Anuk begins the treacherous journey along with Aye, Eagle Owl, and Kinkajou. They have to travel through many beautiful places and many which are not what they seem. Many lands have been destroyed and they are no longer as beautiful as they once were. Along the way she meets numerous creatures, including The Bogeyman, who impart to Anuk their stories and words of wisdom as she continues her journey home. Anuk has to find the courage to face her deepest fears to make it back to Roese Island. But what will face her when and if she arrives? The Adventures of Anuk by Suzanne Mondoux is a truly magical adventure story. The backstory of each character is so detailed, I felt I had been transported far away into a magical land. The whole story was filled with the most enchanting descriptions of places and creatures so that I could actually visualize them. Children will absolutely adore this story because it is filled with tension, emotion, and suspense. I have to add a few pieces from the book, which I believe is the message behind the book. "You create! You decide! If the certainty of fear befalls you it is certain that you will never achieve the wholeness, the full parts of a whole life!” The story also reminds us that all humans have the choice to decide what happens to the earth, and the decisions humans make will affect so many innocent creatures and their habitats. As the story tells us, humans were not created to rule the world but to be a part of it and live in harmony with everyone else. I thought the line by Anuk, ‘My faults are also my lessons’, was a perfect message to the reader. A must-read for children and older readers who love fantasy and adventure. The Adventures of Anuk: The First Leap by Suzanne Mondoux is a beautiful young adult adventure. Anuk is sixteen when she is informed by the Fossa that she has to leave the foster family she’s grown to love like her own and return to her original home in a far off foreign land. She had been a happy girl, living a normal life and learning the skills of running a hostelry, and now she must leave everything behind. She leaves with the messenger and is accompanied by two strange creatures — Eagle Owl and Kinkajou. The reader follows this heroine on a perilous adventure towards her real world, Roese Island, where she will have to fulfill her destiny as an Assisi. With the challenges associated with the landscapes, the barren lands, the monsters hidden in seemingly beautiful places, and unknown enemies prowling everywhere they turn, will she be able to reach her destination alive? A very interesting tale of adventure for young readers, sprinkled with a lot of fun moments, well-crafted scenes, and exotic places for readers to navigate. Suzanne Mondoux shows a deft handling of the plot and right from the start of the story she introduces the crisis, a conflict in the psyche of the young protagonist, by tearing her from the world she’s known as her own and from people she loves. Character development is also handled with mastery and readers will be interested in following the growth curve of the protagonist. When they meet her, she is dependent, a young girl who doesn’t even know she is destined for great things, but as she sets out on this adventure and faces challenges, she begins to look inside herself to identify her strengths and to reconcile with her new reality. The Adventures of Anuk: The First Leap features great writing and storytelling skills, an engaging tale with interesting characters. 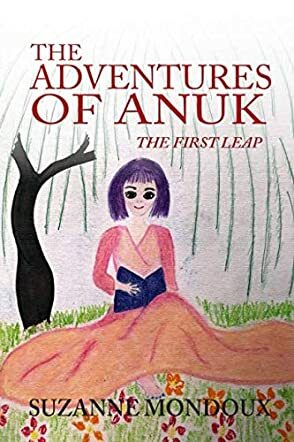 The Adventures of Anuk: First Leap by Suzanne Mondoux is the story of Anuk who is an Assisi Human, half animal and half human. Anuk has been adopted by Lucca and Julea, who are mammal beings, and she has been learning the tasks required to run a hostelry. On her sixteenth birthday, the Fossa comes and tells Anuk that she is now ready for her education beyond the inn, and it is time to return to her original home, Roese Island. Though initially Anuk is terrified, after reading the Book of Poems that has been given to her, she understands that as an Assisi Human it is her responsibility to maintain harmony between Human Beings and Animal Beings. Anuk is accompanied by Aye, an Aye Being, and two non-human beings, EagleOwl and Kinkajou, on this fascinating adventure. She is also given two medallions bearing the Roese Coat of Arms for her protection during the journey. The story is filled with fantasy, adventure, and whimsical characters that will captivate readers till the end of the story. The author masterfully weaves two important messages through the adventures of Anuk; that of kindness and living in harmony and a reminder of the destruction caused by humans on Earth. The fantastical journey and characters will be etched in the minds of readers because of the descriptive and detailed narration that make them vivid. There is a lot of action in the story and that creates a sense of urgency in readers to learn what is going to happen next. It is exciting to read Anuk’s journey filled with danger, riding on a dragon’s back, meeting fairies, and other whimsical creatures from legends. For all those readers who love fantasy, adventure, and magic, this book will keep them enthralled till the very end. The Adventures of Anuk: The First Leap by Suzanne Mondoux is a beautiful adventure, a book for young adult readers and children. The story starts with a powerful premise. Anuk, a sixteen-year-old girl, is informed that she’ll be leaving her adopted family — the only real family she’s known — for an unknown destination. Nothing has prepared her for this decision. Now she’ll have to travel to a faraway land to fulfill her destiny as an Assisi Human and save the world. Her life changes dramatically as she sets out on a dangerous journey, accompanied by strange beings and through unfriendly and enemy infested landscapes to Roese Island. Follow these characters as they embark on a journey across the seas, filled with hazards and disguised enemies. Can they even make it to their destination? Suzanne Mondoux demonstrates great skill in building conflict and she starts from the very first page, allowing readers to understand the pain of an abrupt change in the life of the protagonist. Anuk is a character that readers will learn to admire and the way she grows in daring and generosity, learning to trust her instincts, will appeal. The writing in The Adventures of Anuk: The First Leap is cinematic, featuring beautiful and vivid descriptions of varied landscapes, and allowing readers to understand the depth of the challenges the protagonist will face. Character development is well handled and I loved the evolution of the protagonist as she grows from a girl who is very dependent to someone ready to give her life for a future that might not even be hers. This story is engrossing and one of my favorite adventures of the year.